Thank you to rohan7things for the readership award nomination of Wonderful Team Reader! I’m especially touched because I have only recently dipped my blogging toes in the water of participating in community. First I braved exposing myself on this blogger beach in a swimsuit (so to speak! ), and next I took some time to lay out my towel in a comfortable spot. Then I sat down and observed the water, watching others splash and play. Finally I realized it was safe to go join others in the waves! 😉 I now have no fear of drowning, thanks to all of you. A good reader is one who receives fully, responds when so moved, and understands the contribution to this Presence regardless. Taa-daaaa! 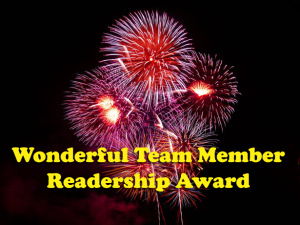 Now here are my nominees for Wonderful Team Member Readership Award. I encourage you to head on over to their towel on this wonderful blogger beach. Maybe you’d like to play in the sand with them. I acknowledge and fully understand that some of my Nominees have chosen not to participate in blog awards. For that reason I have not disturbed their decision by letting them know of this nomination. And I love the amazing sand castles they build! “…exposing myself on this blogger beach in a swimsuit…” Love this! Well put and right on!